If you've got the money, DC has a collection of sparkling comic book-centric jewels you can adorn yourself with. 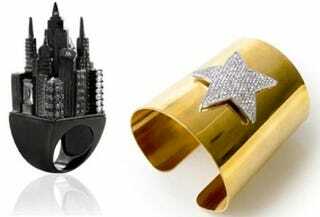 Our personal favorite are the bedazzled Cat Woman claws, and this Gotham City ring. For more go to the website Noir Jewelry, where you can purchase your very own set of kitten claws.